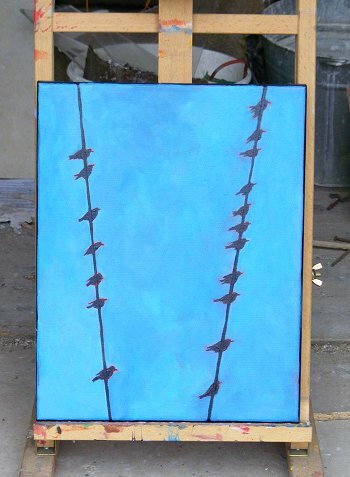 The painting 2 Wires, 18 Birds is now SOLD. See more paintings in this sale. 2 Wires, 18 Birds is part of the End of Year 2009 online sale of paintings, which has launched with paintings at half-price and FREE shipping worldwide until Christmas Eve. Dozens of new paintings are being rolled out on my personal blog Bicyclistic in batches of 5, 6 and 2, 3. To see announcements first follow me on twitter.